Packing lunches doesn't have to be boring for you or your children. Not when they can be packaged in cute bags everyone will love. Make your own reusable lunch bags using novelty fabrics or designer prints that will match anyone's personality. This pattern is fun and easy to sew, and the finished lunch bag can also be used as a practical tote bag for on-the-go snacks, sunscreen, and basic first-aid items when your family is out and about. This lunch bag pattern is a great way to use remnants and scraps left over from other sewing projects. Mix and match fabrics or use one for all pieces. Special Note: All seams use 1/4" seam allowances except for the sides of the drawstring cuff which use 1/2" seam allowances. 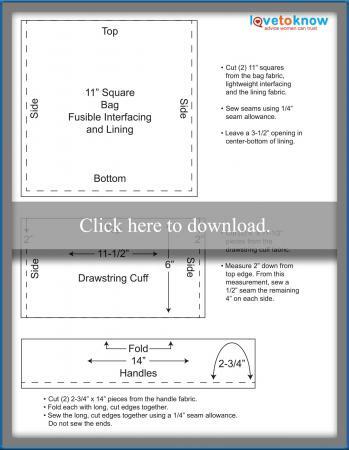 Click on the lunch bag measurements and diagrams image to download and print measurements and instructional diagrams. Cut all fabric pieces and interfacing according to the pattern measurements. If you have trouble printing the download, try these helpful tips. Lay both fabric bag pieces on your ironing surface with the wrong side facing up. Place each fusible interfacing square on the bag pieces with the glue side facing down. Align the edges. Iron the interfacing to adhere it to the fabric. Place the two bag pieces together with the right sides facing. Pin three sides of the square. These pinned edges are the bag sides and bottom. Sew the pinned edges using a 1/4" seam allowance. Sew the lining squares in the same way, leaving a 3 1/2" opening in the center of the bottom edge. Create box corners. Open the bag. At one bottom corner, match the side seam to the bottom seam, forming a point. Measure 2" in from the point. Sew across the point at this measurement. The corner will resemble a triangle. Cut off the triangle 1/4" from the stitch line. Repeat the box corner on the other bottom corner of the bag and each bottom corner of the lining. Lay one handle piece on your work surface. Fold it in half with the right sides facing and the long edges matching. Pin the long edges together. Sew the pinned edge using a 1/4" seam allowance. Repeat with the remaining handle piece. You now have two fabric tubes. Turn the tubes right side out. For each tube, align the seam down the center on one side of the tube and press. Top stitch along each long side 1/4" from the edge. Place the two drawstring cuffs together. Pin the short ends. The short ends are the sides of the cuff. Choose the long edge to be the top. On each side, measure down 2" and mark with a pencil. From the marked point, sew the rest of the side seam using a 1/2" seam allowance. This leaves a 2" slit at the top of each side seam. Press the side seams open. Fold over the unstitched edges of the slit and continue to press to the top edge. Sew a top stitch on the edges of the folded slit, 1/4" from the folded edges. Fold 1/4" on the top edge of the drawstring cuff to the wrong side and press. Fold another 1", press and pin. Sew the pinned edge to form the drawstring casing. Turn the bag right side out, and lay it flat on your work surface. Measure to find the center on the top edge of the bag. Mark the spot with a pencil. Turn one handle with the center seam facing you. Form the handle into a "U" shape. Pin each handle end 2" from each side of the mark. Turn the bag over and pin the remaining handle in the same way. Slip the wrong-side-out drawstring cuff upside down over the right-side-out bag and pinned handles. Align the cuff's unstitched edge with the top edge of the bag. Match the side seams of the cuff and the bag. Pin to hold. Slip the bag, handles and cuff layers inside the wrong-side-out lining. Align the top edges and match the side seams. Pin to hold. Using a 1/4" seam allowance, sew all the way around the pinned edge. Turn the lunch bag right side out through the 3 1/2" opening in the bottom seam of the lining. Hand-stitch the opening in the lining closed. Push the lining and the cuff into the bag. Note: The handles should be extending out the top of the bag. Press the top edge of the bag. Top stitch around the top, 1/4" from the edge. Top stitch again, 1/2" from the edge. Top stitch around top edge. Cut two 24" lengths of cording or ribbon for the drawstring. Attach a large safety pin to one end of one drawstring. Note: There are two openings (right and left) in the casing on each side of the cuff. Insert the pin into the left opening on one side of the cuff. Feed the drawstring around to the opposite side of the bag and out the opening on the right. Continue to feed the string around by inserting into the left opening, around the second half of the cuff and out the remaining opening on the right. The two ends of the string will now be on the same side of the cuff. Remove the safety pin. Hold the ends together. Tie an overhand knot 1" from the end. Starting and ending with the casing openings on the other side of the cuff, repeat the process with the remaining drawstring. You will now have knotted drawstring ends on each side of the cuff. Grasp the knotted string and pull to draw the opening closed. Sometimes, choosing fabrics for sewing projects can be confusing. Fortunately, most any fabric can be used for this lunch bag. The following information and tips should help you with your decision. The fabric used in this lunch bag example was light to medium weight cotton. If heavier weight fabrics, such as canvas, denim, or upholstery are desired, omit the fusible interfacing application. When choosing your fabric, check fiber content and colorfastness. The best and easiest way to do this is to wash and dry the fabric before making the bag. This will preshrink fabric and provide you with important information. If the fabric looks distorted or the dyes bleed, choose another fabric. The finished bag can be washed with your laundry. Fold the bag flat to store. If you like the style of this bag, but a lunch bag isn't what you need, consider altering the size. Whether it is a cosmetic bag, diaper bag, or catch-all bag for the car, the pattern pieces can easily be re-sized. Simply reduce or enlarge the "Bag, Fusible Interfacing and Lining" square to the size desired. Adjust the Drawstring Cuff to 1/2" wider than the square. The new length of the Drawstring Cuff is figured by dividing a square side by 2 and adding 1/2". For example, a 14" square would need a 14 1/2" x 7 1/2" cuff. Adjustments can be made to the handles, if desired, but no special formula is needed. Follow the sewing instructions in the same way as the lunch bag. You can find all kinds of uses for this bag; it's not just for carrying lunch. Create a customized bag of your own and discover just how handy it can be.